Sign-up for email delivery of blog posts. y name is David Russell and I am passionate about leadership, change management, organizational development, organizational culture and how we interact with the community culture. My name is David Russell and I am passionate about leadership and how to lead well. Join the conversation. Why I am Right and You are Wrong. Christmas is a time of the year where we focus on the birth of Jesus accompanied by gift giving and family gatherings. Today I had the opportunity to give the communion thought during our church gathering. If you don’t know, communion (Lord’s Supper or Eucharist) is considered a memorial feast. Traditionally it’s not a feast with large quantities of food and drink; instead it’s a memorial feast made up of unleavened bread or crackers and some wine or grape juice. It is a part of our weekly worship service; a time set aside for remembrance of Jesus’ sacrifice on the cross. But what does this have to do with Christmas? Christmas is about Jesus’ birth not his death…right? One of my favorite Christmas songs is “Mary, Did You Know?” The lyrics ask if Mary knew her son would walk on water, that he would save our sons and daughters, that her baby boy had come to make her new. The song does not specifically refer to the cross, so I decided as we approached the time of remembrance to read some of the lyrics and asked if Mary knew her son would die a painful and gruesome death. I can scarcely imagine Mary at the foot of the cross watching the soldiers swing their hammer as they nailed his hands and feet, lifting the cross up in the air and securing it in place by most likely dropping it in a hole, and her son, innocent as a lamb hanging there taking a punishment he did not deserve. She must have felt helpless. She must have felt hopeless. More than once she must have asked “Why?” Mary, did you know? Did you know that your greatest blessing would endure this kind of suffering? Did you know what his sacrifice would ultimately mean to the world? Did you know his death would save you? Did you know his death would save us all? Mary did you know, that your baby boy will face the whip of torture? Mary did you know, that the Roman guard would give or show no quarter? Did you know, that your lovely son will have his body flailed? This little child you’re raising, on a tree will soon be nailed? Effective communication is a significant part of leadership. Those who communicate well will have a better chance of leading well. At an organizational level, this includes social media. Below are 9 Ways you can make your church or small business social media work well for you. As I typed this I realized it is a lot to take in at one time. So read through this, but do not feel like you have to get this all done at once. To help, I’ve included a FREE check list you can download and work your way though at your own pace. 1. Use an account specifically for your organization. Don’t use your personal account as the primary delivery method. Sure using your personal account is easy, but it does not put the focus in the right place. When you post pictures of the church mission trip, hiking trip, or latest service project on your personal page, all you are saying is, “look what I did with some other people.” That is a fine message to say. A greater message is, “Look what __________ Church is doing” or “_________, INC is serving the community.” Organizational awareness is communicated by posting pictures, videos, and text on the church/business social media page. You can still post on your personal page, but try to limit that to one picture and put the rest on the organization’s page. Better than that, post the pictures on the church page then interact with the church’s post (share, retweet, like or comment). 3. Have a consistent image. Just like the common naming scheme, you need to have a consistent image that identifies you. The most logical image to use is your logo. You also need to make the banners the same. When it comes to banners there are two possibilities. Use an image that connects well with your logo or something that represents your organizaiton. This is the best choice if you plan to leave it alone for an extended period of time (several months or longer). If you want to make a bigger impact, consider changing the banners on your social media pages which each sermon series or holiday season. Just make sure to change them all (Facebook, Twitter, GooglePlus, etc). If one is out of date, it does not look good. 4. Make it a priority. Social media is great for a number of reasons. The two biggest are: (1) it is free and (2) most of your congregation is already using it, as are their friends who do not attend your church. Make a social media plan. That plan consists of events, sermon series, service projects, trips, etc. that the staff knows is coming up. At your staff meetings make it a point to talk about social media and how it will be employed to spread the word of your involvement in the community and the world. 5. Have some checks and balances. Many times the social media outlet for a church or small business is handled by one person. If that is the case, make sure to have some checks and balances. When I am preparing the week’s sermon point posts, I type them all up, include any pictures or video I may use, and run that by the preacher. That way it can be double checked making sure the message I’ve prepared in a social media post will reflect the same message the congregation is expected to take home after the sermon. For a small business, run this by someone who can give informed feedback. This process will also gives you back-up on potential spelling errors or poor placement/timing of a post. 6. Educate your church. Inform your people how social media affects others who are not connected with your church. Liking, commenting, and sharing on Facebook each do different things and have a different effect on the visibility of a post. Likewise, retweeting as well as liking and commenting and tagging others on Instagram will raise the level of visibility. Encourage your members to interact with your posts in ways that will help spread the news. For example, about once a year we remind our congregation that when they “like” a Facebook post it tells all their Facebook friends they think something is neat. When they comment on a Facebook post, it tells their friends, “this is very interesting.” When a church member shares a Facebook post, it tell their friends, “This is something I find highly important and want to make sure my friends see it too.” I don’t recommend your members share every post the church makes, but when there is an even that is open to the community, that post should be shared by as many people as possible. 7. Vary your content. To make content more appealing and to be more organic (“Organic” is code word for natural), your postings should not be the same all the time. If you always post text, it will get old. If you always post a link to your latest sermon or your online bulleting, it will get old. Do your best to vary the content between text, pictures, video, and links. It is best to NOT have a specific rotation (e.g. text, then picture, then link, then text, then picture, then link). That is much the same problem. It is predictable. A natural variety will be one that although planned out, it is not predictable and does not look planned out. 8. Use scheduling tools. Facebook has made it easy to schedule posts in the future. This is perfect for a preaching series or even points from the current weeks lesson. The best way to accomplish this is to get the major points of the sermon from the preacher in advance. Use those points to develop post content for a given week. For example, if the Sunday sermon has 3 main points, schedule them to post the week after the sermon: one on Monday, one on Wednesday, and one on Friday. Use whatever schedule works best for your situation. Another scheduling tool is Buffer (buffer.com). A free version of buffer will allow you to schedule posts to Facebook and Twitter. However, Buffer does not integrate with Instagram at this time. Do not use Buffer if you are going to tie your accounts together (which is the next tip). 9. Tie your accounts together. There is a lot of debate on this topic. However, unless you are a very large church (over 600) you are safe interlinking your social media accounts. By interlinking your accounts it allows you to post something to Facebook and have it show up on Twitter. Post a picture to Instagram and have that same picture automatically post to Facebook. This is a work smarter not harder approach. It is not the perfect answer to every situation, but for those who are working on a budget or a one-man-show, this is a must. Remember, do not tie your accounts together if you are going to use Buffer. If you do both, you will get double posts and it will be a big mess. Social media can be done well. It take a little knowledge and some planning. As always, if you need consulting on this topic or other leadership issues, contact me by asking a question. Could announcements possibly be the worst, most ignored, most wasted part of our gathering time each week? Are there ways to do it better? Should we just give up and assume people just don’t want to be bothered by these pesky details? Yes. And no. Here’s part of the issue. People come to worship to…worship. However, being a part of a community means there needs to be some form of coordination and communication. There are email lists, bulletin articles, bulletin boards in the hallways, slide shows before/after worship, video announcements, and there are announcements from the podium. While abandoning all public announcements may not be an option for your setting, below are 10 dos and don’t of having effective announcements. 1. DO announce the big things. Announcements should be something that relates to the vast majority of the hearers. Keep this to major events, goals, or things the community is focused on for medium to long term. 2. DON’T announce it from the pulpit if it only affects a small portion of people (i.e. small group meeting being canceled, deacon meeting, or ladies bible study schedule change). Those groups should be communicating through their own channels, not by using time during the large assembly. 3. DO keep to three or less announcement topics. The longer you talk the more people will tune you out. If it is really crazy and only every once in a while you can announce four things. But you have to say, "I know this is a lot this morning but please listen to this one additional important piece of information." That will help people keep their focus for just a bit longer. 4. DON’T “take care of business.” If it comes across as a business meeting pattern, people will begin to tune you out. They will start to get their contribution ready, look at their cell phone, check-in on social media, or something else. Changing the feel and possibly the name of the time may be helpful. Some use “Family News” as their announcement time. 5. DO be engaging. If it is positive, be energetic. If it is not worth getting excited about, is it really worth sharing? If it is negative, be sympathetic. If it is not a big deal, don’t make it a big deal by making an announcement. 6. DON’T be fake. Being excited does not mean you are always loud and animated. Being sympathetic does not always mean being quite. Just be genuine. Being fake is a big turn off. 7. DO have the right person make the announcement. This connects to #6. The right person is less likely to be fake. If possible have the person making the announcement be connected to the thing being announced. Whoever it is, make sure they have good communication skills. They don’t have to be perfect, but they do need to be able to communicate to the whole group. 8. DO ask why? There needs to be a compelling “Why” behind the decision to announce something. Why does this need to be said today, now, during this service? Do older people want to hear this? Do younger people want to hear it? Do married people, single people, divorced, widowed, men, women, etc. want to hear this? And by the way, not upsetting a member is not a compelling “Why.” There is no compelling reason to announce to the entire congregation that a member’s great Aunt Sally is having surgery on her big toe. 9. DO find the right fit in the service. If you just announced the death of a member, it is really difficult to get in the mood to sing “Praise God From Whom All Blessings Flow.” All announcements do not have to be at the beginning or at the end. You may want to separate joyful announcements from sad announcements or event announcements from church family announcements. I have found a welcome time toward the beginning of a service a good time to welcome everyone and to highlight a few positive things. A more somber place in the service is a better place for sad announcements. 10. DO be purposeful. If you are in a routine and the routine is the only reason you are doing it…change. Every week is not the same. Treat each week and the information you are considering sharing as its own special time. Will what you are considering sharing be helpful to your audience? This list is not all-inclusive and does not cover very situation and every congregation. You have to figure out what works in your situation. In many cases, information can be distributed in other ways such as email, social media, or text. But there is no one solution to every situation. Comment below with your suggestions or share a strange, awkward, or out of place announcement you remember hearing. The following are potential announcement items for your next worship service time. Which will you announce? 1. The baptistery is getting a new hot water heater next week. 2. The dinner group that usually meets on Tuesday will not meet this week. 3. Next week service schedule will be different due to the holidays. 4. Michael’s Great Uncle Frank had a heart attack and is in ICU in the Netherlands. 5. Our campaign to serve 10,000 meals to the poor starts next Saturday. 6. A pair of earrings was found on the floor in the ladies room. 7. Mrs. Angie Parks passed away Friday evening. Funeral services are scheduled for Monday at 4:00 p.m.
8. The youth bus needs some engine maintenance, if you know of a good mechanic please see deacon Bob. I celebrate Christmas. I put up Christmas lights around our house. We have a tree with a star on top. I think we have a nativity scene, I can't remember; we have not dug it out yet. But all these things: the Christmas lights, the decorations the tree, the ornaments, the star, the gifts, the songs, none of it (NONE OF IT!) makes Jesus Lord. All of that is there as part of my celebration of who Jesus is. Some Christians do not celebrate that way and that is fine. But it has been a tradition in our family so that is what we do. 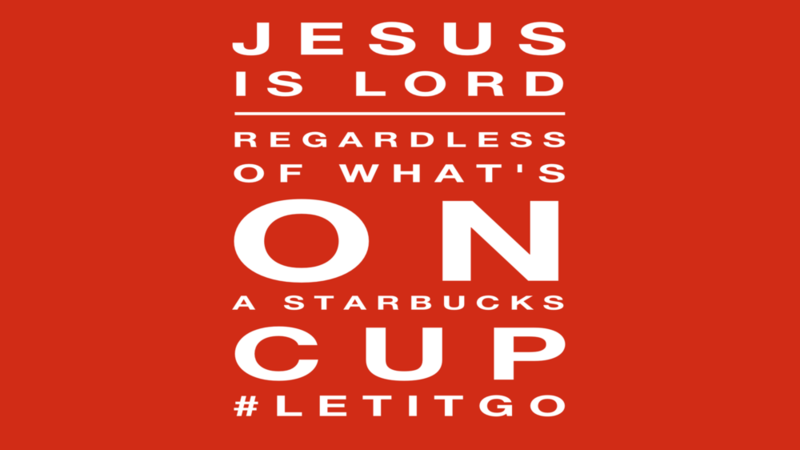 When it comes to the whole Starbucks cup hype, I do not see what the issue is. Starbucks has their cup. It is their right to do with their cup as they wish. If they want their cup to be purple with orange polka-dots, it is their prerogative. We celebrate Christmas the way we wish. Starbucks can celebrate or not celebrate as they wish. Would you want someone telling you how you should celebrate Christmas? Would you want someone requiring you to put up or take down a tree, a wreath, a star? When the world was older people thought the Earth was flat, and sailing too far would result in falling off the edge. There was also a time when people believed the sun went around the earth. People think George Washington had wooden teeth, that you can get warts from a frog, and that “irregardless” is not a word. All these beliefs are untrue. “Irregardless” is a word, so says Webster, but I do not recommend using it. Have you ever wondered what it feels like to be wrong? If we evaluate the times when we have been wrong they are always in a past tense setting. I was wrong. I thought wrong. I did wrong. It is contrary to human nature to live in a wrong mindset. We may choose to do wrong, but when we do we have some form of justification in our mind. We have rationalized a good reason for doing what is contrary to a set of rules or expectations. However, we never truly operate in a mindset of being wrong. To summarize Randy Harris, as soon as we think we are wrong, we instantly change our mind and are right again. So we never know what it feels like to be wrong, only to have been wrong (in the past). 1. Person “A” is right and person “B” is wrong. 2. Person “B” is right and person “A” is wrong. · “My beliefs are truth. · The truth is obvious. · My beliefs are based on real data. When people do not share our beliefs we can see them as missing the “obvious” or having not selected the “real data.” Can you see why we have conflict in our lives? A great illustration of this is the Ladder of Inference. The ladder of inference is a metaphor for a process that happens in our minds before we take actions. Those actions can be something we do, something we say, or even an attitude we have. I will explain how the ladder works, but make sure to keep reading so you understand the most dangerous part of the ladder. Like most ladders, we will start at the bottom and work our way up. Postulated by Chris Argyris in 1974. Chris’ education and career included graduating from Cornell, and being a professor at Yale and Harvard. Seems this guy has some smarts. 1. Observable Data, is ALL the data available to us. It includes everything we sense through seeing, hearing, touching, smelling, or tasting. It could be the tone of someone’s voice, the words in a paragraph, the look on someone’s face, the noise in a room, or the current weather. ALL data is all the data that is available to us. Keep in mind that there may be some relevant data that is not available to us. 2. Data I Select. We do not use all data. Our brains have limits. Therefore, we select some (not all) of the available data. The selection process is where we as individuals begin to diverge. You may select data that I do not and vice versa. 3. I add meanings. These meanings are based on personal experiences, cultural norms. It is affected by our mood and attitude, possibly even our health. 6. I adopt beliefs. This is the point where we see something as truth. After all, how many of us would purposefully believe something we know to be untrue? Here is the MOST DANGEROUS part of the ladder. There is a feedback loop (reflexive loop) that begins when we adopt beliefs. Feedback is a cycling process that feeds on itself. Like the feedback in a microphone/speaker system. If the microphone gets to close to the speaker, sound coming out of the speaker is picked up by the microphone, which sends it to the amplifier, so it comes out the speaker louder. The microphone picks up the louder sound and sends it to the amplifier, so it comes out the speaker even louder. The process continues until a loud screeching sound kills all our ears. The movement up this ladder is the same kind of continuous cycling feedback process. As we adopt beliefs it begins to affect the data we select. We believe something to be true so the natural thing to do is select data that supports our already adopted belief. We collect more and more supporting data to bolster our belief. We will even ignore relevant data that is contrary to our beliefs. Learning something new happens, when we begin to select data that does not support our current beliefs. 7. I take actions. The actions we take are based on beliefs we hold. Here is a scenario. You are in a meeting with colleagues. You notice one person who sits slumping in their chair with arms folded (you just selected data). They appear to be unengaged (you just added meaning). You think they are distracted (you just made an assumption). They must not be interested in this meeting (you just drew a conclusion). This person obviously lacks professionalism (you just adopted a belief). Now the feedback loop. You select more data to support your adopted belief that they lack professionalism. You notice their shoes are scuffed, their tie is loose, and that there is an ink stain on their shirt. You have selected more data to support your belief that this person lacks professionalism. Because this person lacks professionalism you treat them differently than you do the others in the meeting. Their input becomes less valuable and you are less likely to call on them for assistance. What you do not know is that this person was up all night with a sick child in the emergency room. Now you know why we can think, “I am right and you are wrong”…at least in our own minds. Next time we will look at how to better understand someone who thinks differently. Management vs. Leadership: The manager is a copy; the leader is an original. It is time to get back to writing. I’ve been away for some time due to some personal reasons and am looking forward to getting back to writing. Consider the difference between a business owner and a business manager. The owner is the original, the idea person, the one who started everything in motion. The manager is the one who is put in place to oversee the day-to-day routines of the business to ensure they are all operating properly. These routines can include personnel schedules, training, opening and closing, and a wide variety of other functions. They work off a checklist of dos and don’ts. It is the manager’s primary responsibility to make the owners vision come to life. Way back in 1988 David A. Van Seters and Richard H.G. Field said, “The new leader must be visionary, willing to take risks, and highly adaptable to change.” Part of being original is the ability to do things differently. Michael Jackson was a musician like many others before him. However, he is seen as an original. It gets tricky when looking at church leadership. Christians are disciples of Jesus. A disciple is a follower. Does that mean that church leaders must only copy what Jesus did? Yes and no. We are to copy Jesus as it relates to his love of the Father and his love of people. How we live our lives and how we treat others should emulate the personality of Jesus. It is the character of Jesus that is important. It is note worthy to recognize that we do not live in the same time, culture, economy, and political world that Jesus lived in. Therefore there are many aspects of what Jesus did that should not be copied today. To be a copy we would need to dress as Jesus dressed. To be an original we would need to dress in a way that helps us relate to others. To be a copy we would need to speak the same language Jesus spoke. To be an original we need to speak the language that helps us communicate the hope we have. To be an original we need to travel in ways that efficiently help us connect with our world. “Doing things the way we have always done them” in church leadership is not the right answer and is not an appropriate response. Contrary to popular belief, the way we do things today is not they way they have always been done. Imagine how different our view of Jesus would be if the only miracle he did was to change water into wine. Over and over, the same miracle. When the royal official in John 4:46-53 came to Jesus and asked him to visit his son and heal him, Jesus did not say, “Fill six stone water jars to the rim and I will change that water to wine.” After Lazarus’ death Jesus did not say, “bring me some water that I may change it to wine.” In these cases Jesus did not do the same thing. He did what was beneficial to others. What changes have you seen that positively impacted the church? What same-old-things do you see that could benefit from some originality? Sitting in a coffee shop in Oklahoma City I over hear three ladies talking. I don't make out all of their conversation. However, I do hear one woman say, "...that's a blessing." I thought to myself, "Yes it is." I have no idea what they were talking about but I know this, it was a blessing for me just by making out the phrase, “that’s a blessing.” I was blessed because I was in a small way able to share in a community moment when someone else’s experience was affirmed to be a gift. That affirmation is part of why community is so important in the Christian faith. Christians in community see, “in the companionship of a fellow Christian a physical sign of the gracious presence of God” (D. Bonhoeffer). Christ lives in us. When we are together Christ is with us. When we talk to each other God is a part of our conversation. By our words we are leading people in some direction. We are either leading them closer to God or further away from God. The power of life and death is in our words (Proverbs 18:21). Small phrases of blessings are like espresso. They are concentrated and powerful. Let us use the power of life in our words to bless people in our lives. We may unknowingly bless others around us. I was born and raised in the Churches of Christ. Through 42 years I have been a part of many congregations. I’ve seen wonderful, joyful, strange, and sad things happen over the years. But there is one thing I have rarely seen. I never realized how abnormal we were. In 2010 the church was going through an Elder selection process. I was serving as the deacon over the Youth program and Office Administration. Although our congregation’s personality and culture were slightly different than other congregations, our pattern for organization was the same. Elders ran the show. Most, if not all, ideas were vetted by the Elders and permission was given for everything from replacing broken plumbing to the scheduling of work days. We had quarterly Elder/Deacon meetings that one of the Elders would chair with an agenda was developed by the Elders with Deacon input. We were normal because we did things for the most part just like every other congregation did them. I never realized how abnormal we were in God’s eyes. We were abnormal because we were not following principals given in scripture. who are known to be full of the Spirit and wisdom. During a conversation between the Elders and myself, we began talking about the roll of Deacons and Elders. In that conversation the Elders and I discussed how they could best help the Deacons do their jobs so the Elders could “give [their] attention to prayer and the ministry of the word.” The answer was straight out of Acts 6, “turn [the] responsibility over to them”. Many questions were asked. What do the Elders need to help them do their job better? What do the Deacons need to help them do their job better? What are we doing now that is hurting our situation and how do we stop doing it? What are we doing now that is helping our situation? How much control do the Elders need (Biblically speaking)? How much freedom do the Deacons need? What other organizational adjustments need to be made to help both groups? How will we manage the change? How will we ensure the change sticks? The Elders were going to empower the Deacons, really empower them; not just talk like they were empowered but they were also going to act in ways that supported the Deacons authority. To do this, Deacons needed to be more self-reliant, more responsible, and operate more freely within their ministry areas. Elders needed to be more hands off, to refer problems and delegate tasks to the Deacons on a continuous basis. One small act of an Elder assuming responsibility for a Deacon’s job would undermine the whole process. The Eldership had to be committed to seeing this through, even through the pains of change. Some of the Elders thought they were WERE empowering the Deacons. I explained to them that it does not matter what the eldership thinks, what matters is what the individual Deacon thinks. If a Deacon thought they had the power and authority to make decisions within their ministry, they would not come to the Elders asking permission for this or that. So we devised a plan. of your areas of responsibility. Did that really just happen? Recently I was taking with one of my old Deacon buddies. We were laughing about that night and how he had turned to the person next to him and said, “Did that really just happen?” This single act of empowerment, trust, respect, love, and hope, transformed the Eldership and the Deaconship in beneficial ways that neither fully anticipated. I’ll share in future posts how we managed the change process and established new norms. I’ll end by saying that was a night I will never forget. A touchdown for the church. Management vs. Leadership: The manager administers; the leader innovates. Lets look at innovation first…because that is the one that scares us as Christians. To innovate is to introduce something new or to change something that is established. So innovation sounds like a bad thing. Think Revelation 22:18-19 or Deuteronomy 4:2. Do not add or take away! That is the general rule. Does this mean we should not innovate? Consider the Latin origin “innovatus” which means to renew or alter. Renewal is the act of restoring or replenishing; to revive or reestablish. Is that not our job as Christians? Are we not to be at work restoring those who have fallen away from God? Replenishing hope in our land? Reviving and reestablishing relationships with The Creator? Sometimes that is aided by innovations that help us reach our world and help our world reach God. I think of Paul and the unknown god of Acts 17:16-34. Paul doesn’t just start preaching, he uses an innovative approach. He goes to THEIR place of meeting, not a church building that has my special church’s name on it. Then he complements them on being very religious (flattery). He also studies their objects of worship; he did not dismiss them because they were different or even dead wrong. Instead, he used them to evaluate the people and get a better understanding of their thoughts, feelings, and attitudes. Alter is the other part of the definition. Can we as Christians make alterations? Close study reveals the answer to be, “yes.” Innovation examples could include, early Christians meeting in the temple courts as well as homes, warehouses, and apartment buildings. Eventually they began building structures for church assemblies and church work. They also constructed baptisteries where water was scarce or dangerous (I’m reminded of a story of a Deacon who’s job it was to scare off the crocodiles for a baptisms in a river in Africa – talk about a need to be innovative). I can imagine early arguments against baptisteries being surrounded around questions of validity or authority. Are baptisms valid if the person is baptized in water that does not flow freely from the grace of God? Does man have the authority to collect water for the purpose of baptisms? Many times the advocates for NOT being innovative forget that the Church as they see and experience it now, is NOT the way church has always looked or acted. Innovation is what got you the church you attend now. Administering refers to the action of management or to have executive charge of, to bring into use or operation, or to make application of. Each of these refer to the enacting or maintaining an existing system or process. One administers the law, administers justice, or administers medicine. Origins of this word come from the Latin administrare, which means to assist, carry out, or manage the affairs of. All of these have the idea of assisting or maintaining something that is already in place. The first thing that comes to mind is Acts chapter 6 where we see the selection of deacons. These men administered the distribution of food to widows. They assisted with and managed the process. While this is a part of the work of servant leaders, it is not the totality of what church leaders are charged with doing. Church leaders (elders, ministers, etc) need to relieve themselves of the types of duties that would cause them to “neglect the ministry of the word of God” (Acts 6:2). Give the management of church tasks over to the deacons so you may “give [your] attention to prayer and the ministry of the word” (Acts 6:4). The ministry of the word is not about budgets, carpet, and building projects. Be like Paul, who innovated so he might “win as many as possible” 1 Cor 9:19. In my next article I will share with you one of the most spectacular acts of church leadership I’ve ever experienced in my lifetime. Yes, it was that good!!! Once a band of people went on a journey to the East in search of enlightenment. Included in this group were several people, each with a skill or talent that aided the group. One of these people was Leo. Leo is described as a servant who seems to always have what the party needs. He is described as always being happy, willing to help, and keeps a positive attitude. Along the way Leo disappears. The group begins to slowly fall apart. Even members of the group begin to say that Leo took things from the group that would have been useful to them. While the items turn up later, the stress and deterioration of the group leads to arguments and eventually a complete disbandment of the group, with each person going their own way. When you think of leadership and being a leader, what is the first thing that comes to your mind? Is it making rules? Is it enforcing rules that already exist? Maybe you think of board meetings and sitting at the table with other decision makers. CEOs and presidents may come to mind. Today, try to think of leadership in a way that is completely opposite of what might normally come to mind. This concept of leadership is important because leadership is not about lording over one’s subjects, but is about doing whatever is needed to help them succeed. Robert Greenleaf said servant leadership, “begins with the natural feeling that one wants to serve, to serve first. Then conscious choice brings one to aspire to lead.” The aspect of being a leader is secondary to doing what is necessary for other’s success. Jesus clearly instructs us that the idea of power and authority should not be among those who wish to truly lead. He says in Mark 10:42-45, “…Whoever wants to become great among you must serve the rest of you like a servant…” The opening story is a summary of an example of servant leadership found in the Hermann Hesse’s story Journey to the East. Here is a condensed conclusion. Sometime later, the narrator of the story, a man named H.H. tries to recount the events of the journey. In an effort to get the complete story he sets out in search of Leo. When he finds Leo he learns that Leo is much more than a mere servant; Leo is the leader of the order that sanctioned the journey to the East. And Leo’s disappearance and the whole ordeal were part of a test. At the outset, the test was failed by all. But now that H.H. had returned to try and understand what happened, he learns that the servant is the leader, and that the knowledge he sought from the journey to the East was just now coming to him. It is in service that true leadership is found and that the end result is for one to serve and then be forgotten.